BALTIMORE — Baltimore Ceasefire has become a major anti-violence movement in the city. The slogan "Nobody Kill Anybody" is resonating from the streets to the classrooms in Baltimore City Public Schools. "In a city like Baltimore, it's really important that students have the opportunity to think, process and engage with how they are feeling on a day to day basis," said Julia Di Bussolo, the executive director of Arts Every Day. Arts Every Day, a non-profit in Baltimore, recently displayed a 10x10 art exhibit at Motor House in Station North featuring artwork done by city school students. Their artwork reflected their thoughts about the Baltimore Ceasefire and what is going in their city. "At the very core of what the arts do, it makes students feel a part of a community, part of our city and feel connected to one another," said Di Bussolo. 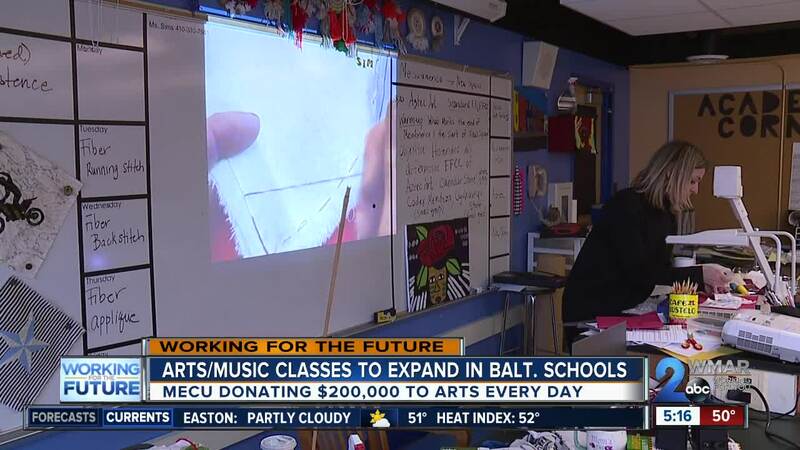 The mission of Arts Every Day is to ensure that all students in Baltimore City have access to arts and music. Its getting a big financial boost to help make that happen through the credit union MECU. MECU is donating $200,000 over four years to fund two programs called the Arts Challenge Fund and Music Ed Remix. Principals who already have an art and/or music teacher can apply to the Arts Challenge Fund to receive money for purchasing supplies, instruments, etc. Di Bussolo says this will also be an incentive for schools that don't have a certified art/music teacher to add one to their staff. "This is going to really open up a big opportunity for Baltimore City students to go above and beyond what they're able to do right now," she said. The Music Ed Remix program will pair schools with local musicians to work on original or re-imagined songs, said Di Bussolo. Both of these programs coincide with the school district's 10-year Fine Arts Strategic Plan, which aims to get a certified arts and music teacher in every school by the year 2022. Chan'nel Howard is the Fine Arts Coordinator for BCPS. She says about 50 percent of city schools have music education and about 75 percent of schools with kindergarten through eighth grade have visual arts education. "In terms of all of the issues that we've had plaguing our city, our kids need that opportunity, they need that outlet," Howard said. "So we're pushing for not only kids to have that aesthetic part of the arts but also that part that helps them to just kind of grow and be immersed in those things that make them amazing." "It's important to keep arts programs in schools," said John Hamilton, CEO of MECU. "We think it spurs creativity in kids, helps them to imagine, helps them to dream and helps them to see the best in themselves." Arts Every Day would like to continue to grow the Arts Challenge Fund and Music Ed Remix. If you would like to donate, click here for more information.